Thanksgiving Hacks to Stay on Track! It’s that time again for my fellow Canadians! Thanksgiving is upon us and that means family time, a well deserved long weekend, and GOOD EATS! If you’ve started a fitness regime and are worried about how you’re going to manage the big feast you’re about to indulge in this weekend, join the club! 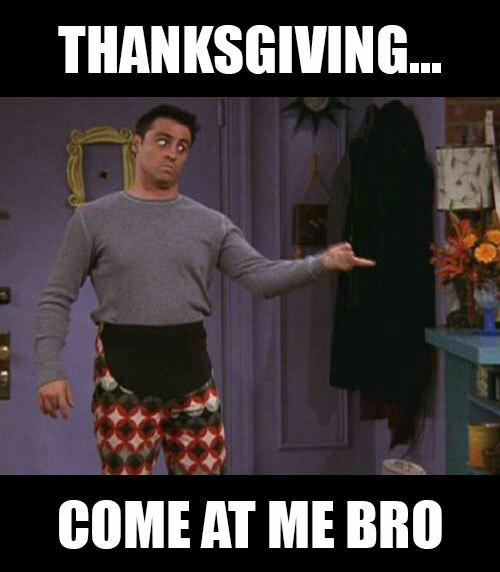 After all, Thanksgiving is based around a giant meal, and most of us associate it with stuffing our faces with all sorts of delicious foods, then having to unbuckle our belts or change into those buffet pants before passing out on the couch. It doesn’t have to be this way. You made a commitment to improve your lifestyle and Thanksgiving can be like any other day where you enjoy in moderation and make the best choices available. Here are 5 simple ways to enjoy Thanksgiving without beating yourself with guilt or feeling super uncomfortable afterwards. Like any other day, keep yourself hydrated throughout by kicking back at least 8 glasses of water a day. Our bodies are made up of 60% water so if you are feeling thirsty, you are already dehydrated. Don’t drink water just to quench your thirst, drink it to facilitate your body functions such as nutrient absorption and elimination. My previous post about lemon water emphasized that drinking water before meals can curb your hunger and make you feel fuller. Many people also mistake dehydration with hunger. When they are thirsty, they think they are hungry, and they try to quench their thirst with food. This can be avoided by staying hydrated all day. Whether you manage to fit in that gym session before preparing to host the big feast or not, try to stay on your feet and keep moving. Try for a quick 20 minute run or interval session to rev up the heart rate and metabolism even after the work out is done! Even a quick yoga class or stretch routine to destress before the party will help. Instead of lying down after the meal to watch TV, get outside and play some games with your family, or take a stroll and enjoy the beautiful autumn weather and colors together. It doesn’t have to be a full-out workout today, but moving even just a little will go a long way. Going for a walk after eating helps with digestion and making it a goal to move after your meal will keep you mindful of how much you eat. This applies everyday but make a conscious effort here to fill up your plate with more colourful veggies first. Vegetables are easier to digest than starches and meats, so by eating them first, it will aid your digestion and avoid stress on your body. This also ensures your get plenty of wholesome nutrients in your feast and you’ll start to get fuller. This doesn’t have to be restricted to the beginning of your meal either – continue to enjoy your veggies throughout! It’s really easy to overeat and binge when we eat too fast. Take the time to chew all your foods and really savour the delicious meal. Digestion begins in the mouth so by breaking down each bite in your mouth, it prepares the rest of your digestive system, promotes better absorption and helps you avoid that sluggish feeling afterwards. Take little pauses between bites and wait a bit before getting up for seconds. You might realize you’re already satisfied and no longer need a second serving. Enjoy the company you’re in and be happy! The mood you’re in when your eat makes a difference in how your body utilizes what you eat and how it functions. That’s right. Eat a slice of pie, take a bite of the brownie, sip on that sangria – and make sure you ENJOY it! If that’s what you want, portion out the dessert and sample a few to satisfy your cravings. Restricting and depriving yourself can lead to frustration and subsequent binging. A few bites aren’t going to break your diet – just keep it from spiraling into a binge-fest. Enjoy the holiday festivities and the yummy treats that come with it with your loved ones! Be thankful for all that you have and continue to work hard to get what you want. Remind yourself why you chose this journey and be thankful for good health!